Oh my goodness, that looks so good! Thanks for sharing! It's cold and snowy right now, but this reminds me of summer...can't wait to use my imagination and pretend it's here! Hi there, just thought we'd let you know that we stumbled on your recipe here, and wanted to share it on our Facebook Page. Thanks for sharing! We were thrilled and you made our day! It is so good with balsamic vinegar as well! Just made this with everything above, plus the balsamic and whole basil leaves. YUMMY!! Simple and yummy. Thanks for the delicious looking suggestion. I'm a high school teacher and I'm fixing this for my "lunch bunch" today. Can't wait for their reactions. 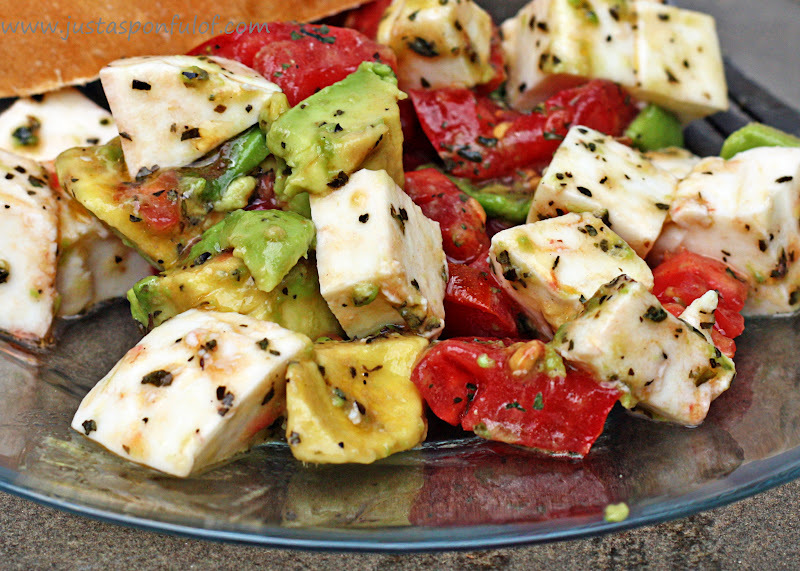 Bet this would be fabulous with some balsamic vinegar drizzled over the top. We are glad everyone is enjoying this recipe. A drizzle of basalmic is yummy to add! Have done something very similar but w/o the cheese. This is on our lunch menu for tomorrow! I am doing Weight Watchers and this is a definite "yes"! This looks awesome. I've gone gluten free in the last year, and it has completely changed my diet. This looks like a must! I cannot wait to try this! I might add some tortollini to it and eat it for lunch :) YUM! Just had this for lunch, but I added balsamic vinger and oregano. YUMMY!!! This looks delish... I want some now! You can use plastic wrap and put it directly on the salad but it will likely still brown. The better option would be to put the whole salad together except the avocado. Then cut half an avocado each time you want to eat it. Store the other half with the pit, covered in plastic wrap in the fridge till you're ready for some more! 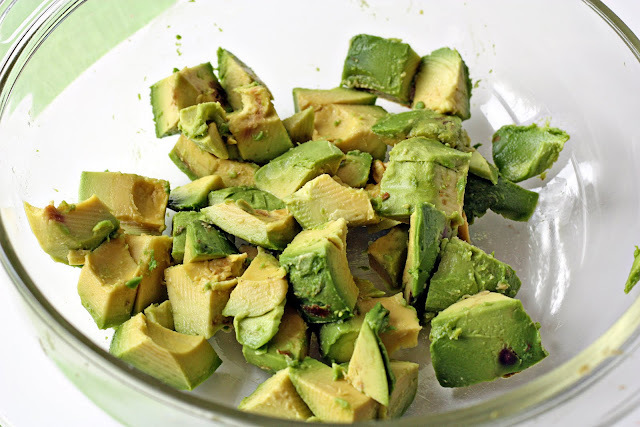 Put just a bit of chopped onion with the avocado in a ziploc bag to keep the avocado from turning brown. I'm here from Pinterest . . . 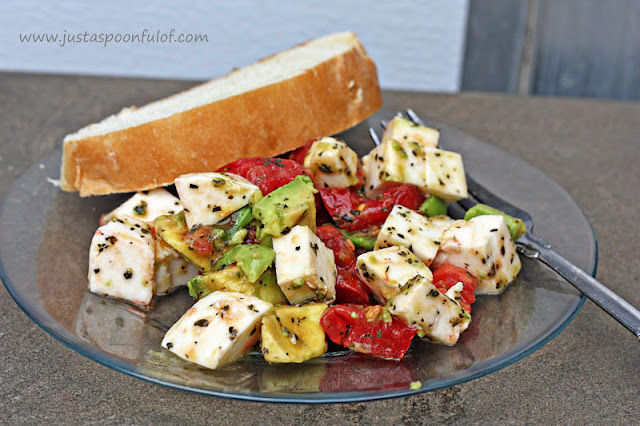 I've never tried basil with avocados but that sounds yummy! 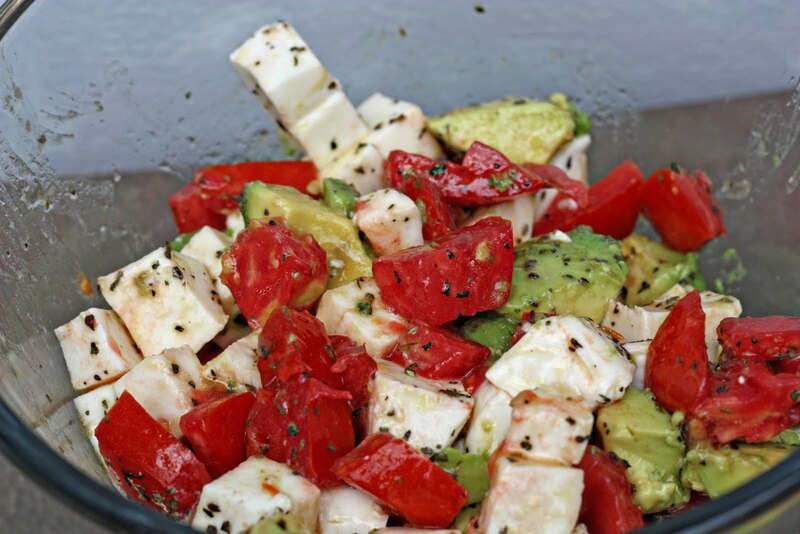 We do a summer salad that's similar and delicious. We use corn, cut from the cob, cilantro, lime juice and olive oil. Great blog! I'l be sure to check out your other posts! Thanks. We hope you enjoy the recipes. would be good with chicken too. What is the name of your blog? We would love to check it out. I'm stationed in Sicily, where fresh mozzarella is a staple. 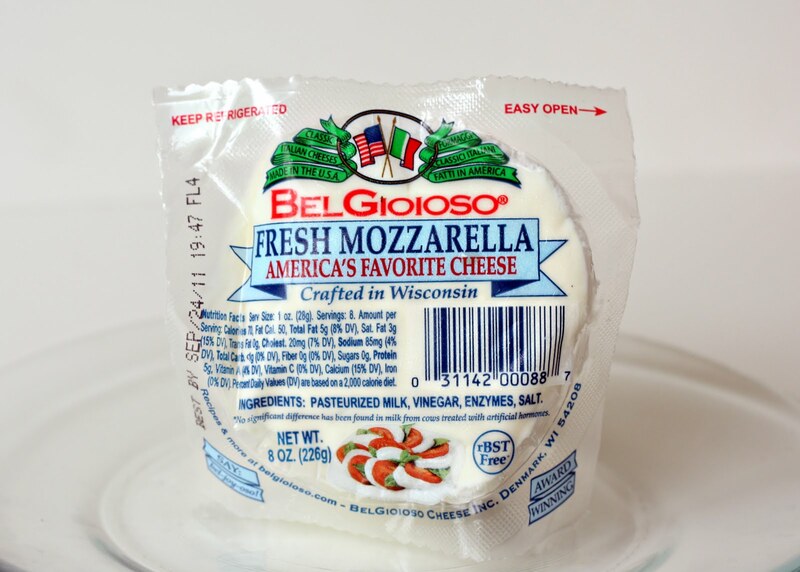 We also have buffalo milk mozzarella, which I love even more, so I'm going to try making this with that instead! Man this looks so good. Found you on pinterest can't wait to read more. I love this salad, though I prefer red wine vinaigrette! 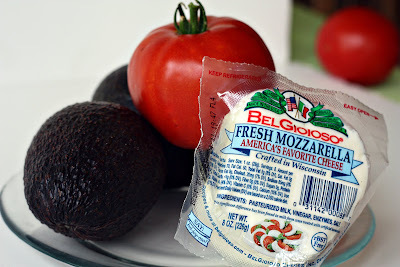 I had never thought of combining mozzarella with avocado, but it does sound good. Think I could get away without using Basil? I dislike the taste of basil. Yes. Use whatever taste good to you. @Joanna... yes, you can forget the basil, but how about adding fresh chopped Italian parsley? Just a couple of ideas... a sprinkle of lemon juice will help the avocado not to brown and the BEST mozzerella cheese to use is buffalo mozzerella. You can find it at most Italian high-end specialty shops. This looks and sounds delish! I think I may try it with cilantro in place of the basil tho. Thanks for sharing!!! Is there calorie information available? 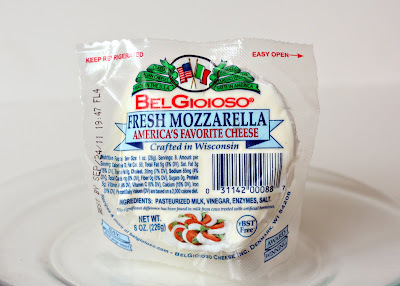 We have found our fresh mozzarella at our local grocery store and also our WalMart carries it in the specialty cheese section. Anybody know how many calories would be in a serving? This is delicious! I saw the pictures and headed to my kitchen to make it. I did add a dash of balsamic vinegar and mmmm! I saw this on pinterest (pinned it-hope that was ok) and can't wait to try it! That is fine. Hope you enjoy it. Never heard of putting onion in with avocado to keep it from browning. Will have to try. Lemon/lime doesn't always seem to work. I make a mozzarella, cucumber, and tomato with olive oil, fresh basil and balsamic vinegar in the summer and this looks like another great idea. 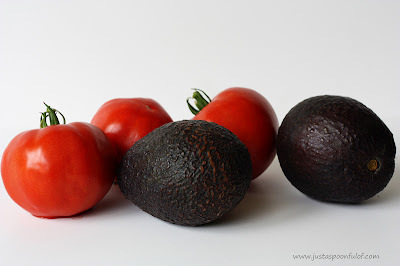 As for avocados turning brown, I sprinkle lemon or lime juice on them, salads I want to store in fridge, and sliced apples. Not only does it keep them from browning but it also keeps it fresh tasting and looking. Thanks for a new recipe. 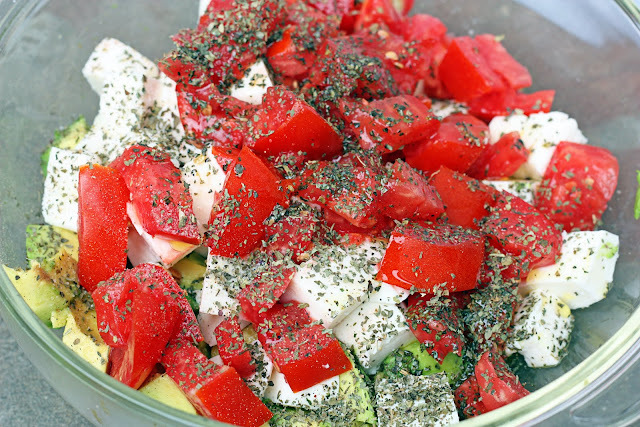 I've made this salad several times now and it's absolutely delicious and so simple! I'm even using it for a recipe I need to bring to a bridal shower this weekend. Thanks for posting it! We make this ALL the time. However, for the dressing we use "Girads Champagn Dressing" and add chopped cilentro. Yummy! I stumbled across this recipe via Pinterest. I made it for the second time last night. If you use fresh basil and add some balsamic vinegar, I swear, it'll change your life! Thank you for sharing such tasty goodness! How many servings does this recipe make? I made it tonight and it's delicious! I've made this a couple of times and it is so ridiculously amazing. I didn't have mozzerella tonight, so I left that out and it is still awesome. THANKS! yummm I want to make it now. what can you eat it with? Love this recipe, I've made it often. I actually made an accidental variation because I didn't bring the recipe with me and mixed it up with another one. A tasty oops! I used cilantro instead of basil and added a little lime juice, light and tasty! I'm thinking it may be good with garbanzo beans. Has anyone tried it that way? I have and it is very good. This was very tasty. I think next time, I will add red onion for a little more flavor and crisp. Wow! That look so fresh and healthy. I think it would be great with Italian salad dressing! Has anyone tried it with pesto? When I was a child, we lived in San Diego California and had our own avocado trees. I have loved avocados all my life :) A bit of red onion is good but only a tiny bit, it will overwhelm the mild flavor of the avocado. Something else that is very tasty is just mash or dice the avocado and salt it and serve it on the side with Couscous made any way you like. CAN THIS RECIPE BE REDUCE DOWN FOR ONE PERSON? 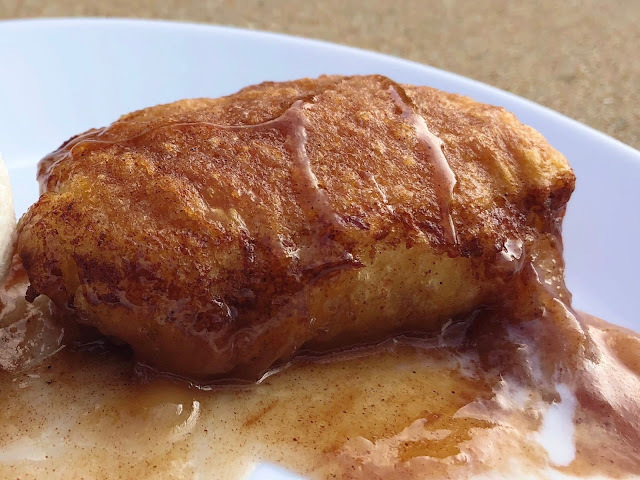 wow - started trying to find this recipe from an obviously pirated blog spot. So sorry that happened to you, but it was important to come back to the original source. Sounds so delicious, making for birthday dinner tonight! Thanks! That happens a lot with our pictures, but we appreciate you coming back to the original post. Hope you enjoyed.